Americans Are Dreamers Too | The Gettysburgian. 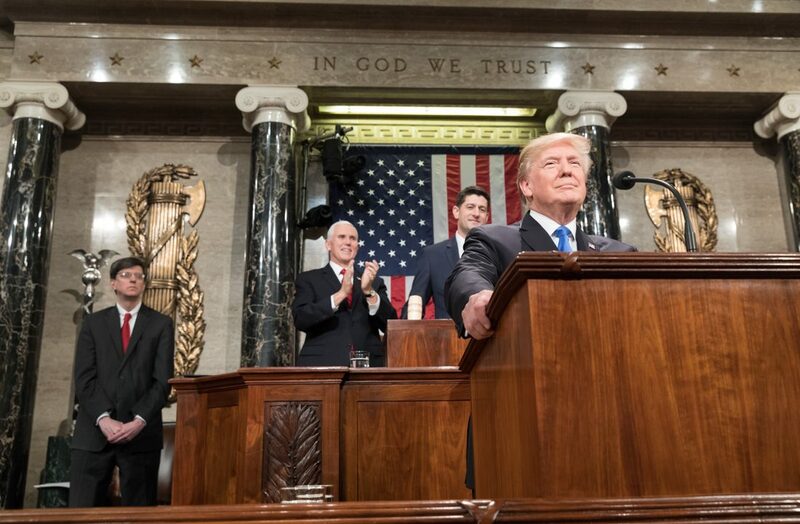 President Donald J. Trump’s first State of the Union Address was overall lackluster, and the ineffable Trump energy was notably absent from the speech, but there was one line in particular which was reminiscent of the America First Trump we elected: “Americans are dreamers, too.” Indeed, with all the talk in Washington D.C. as to the fate of the so-called “dreamers” who are, in fact, illegal aliens, it is easy to forget that the primary function of the United States government is to serve and facilitate the interests of Americans, not illegal alien foreign nationals. Congress is living in Clown World and the government was even briefly shut down over illegal aliens. President Trump stood resolute to remind members of Congress and the nation that Americans also have goals and aspirations, and Congress exists to facilitate the goals and aspirations of Americans not the goals and aspirations of illegal aliens. In the address, the President expressed his willingness to grant amnesty to over one million illegal aliens in exchange for heightened border security (presumably the wall). This is a bad deal. The vast majority of illegal aliens enter the United States with a visa and simply overstay that visa. Conversely, relatively few illegal aliens enter the United States through an illegal border crossing (though this is still a serious issue). Therefore, it is more important for the United States to develop a comprehensive visa exit system which would monitor when visas expire and whether those visa holders actually leave the country when the visa expires. If they do not leave, they should be subject to immediate deportation in accordance with the law. Presently, the United States has no comprehensive visa exit system, and trusts that visa holders will simply leave when their visa expires. This is indeed Clown World, and a visa exit system is paramount for United States immigration enforcement. Despite this, a border wall is still needed in order to tighten our border security and combat individuals and illegal substances coming into our country unlawfully. For the United States to become a serious country that actually enforces its laws it must do several things: construct a wall and heighten security on the southern border with Mexico, develop a comprehensive visa exit system, deport every single illegal alien in the United States to their country of origin (in accordance with the law), and not grant previously deported illegal aliens reentrance into the United States until the legally mandated ban on their reentrance has has expired. Popular arguments against my proposals often revolve around the economy and humanitarian concerns, and to that I say it is beyond shameful that the United States economy has in any way become dependent on the labor of illegal aliens and it is not humanitarian to value the interests of illegal alien non-Americans over the interests of American citizens. A country is more than an economy, and a country should serve its countrymen not foreign nationals. We must all remember that Americans are dreamers too and in order to fulfill; those dreams we need to have a serious country again which enforces its laws. Only then can we Make America Great Again.